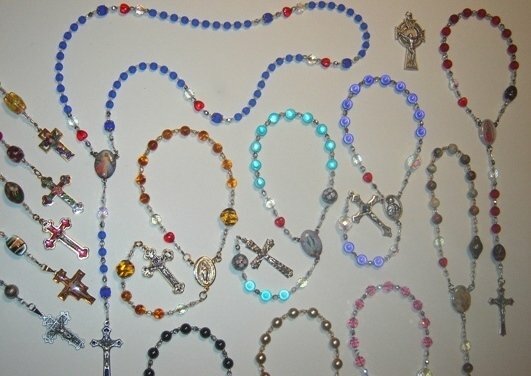 A special rosary website for all! Welcome! Christ's peace to all who visit. Enjoy browsing our pages, subscribe to our rosary blog (unique & interesting news feed, site updates, store to come) and, to check out some visitor greetings, feedback, questions & stories, click here. This interactive site has so much to offer you! For example, you can pray online and study our classically illustrated rosary at your own pace, browse a colourful collection of innovative beads, or simply learn about this traditional Christo-centric Marian prayer of the Church. Perhaps you're interested in how to pray it, the promises & benefits if offers, or the meaning of the Joyful, Luminous, Sorrowful & Glorious Mysteries in the life of Our Saviour. You may also want to browse the many informative, inspiring and useful books, CDs/audio tapes, and DVDs/videos on this devotion, that are available to us today! And, don't miss our fascinating pages on the origin of this holy prayer and its often miraculous role through history. Last but not least, you can access free copies of all the papal encyclicals ever written about this pre-eminent way of Christian prayer. These unique, handmade rosaries are created in Ottawa, Canada, and include beads for the 'Glory Be' & 'Fatima' ('O my Jesus...') prayers. To examine our bead design close-up, check out this simple diagram. "One day, through the Rosary and the Scapular, I will save the world!" (the Blessed Virgin Mary to St. Dominic, circa 1208). Catholic Question of the Day! Read about/listen to today's Saint of the Day! What's on the Liturgical Calendar for today? Le rosaire en francais! Commentaires d'Ecriture et meditations spirituelles pour chaque mystere.